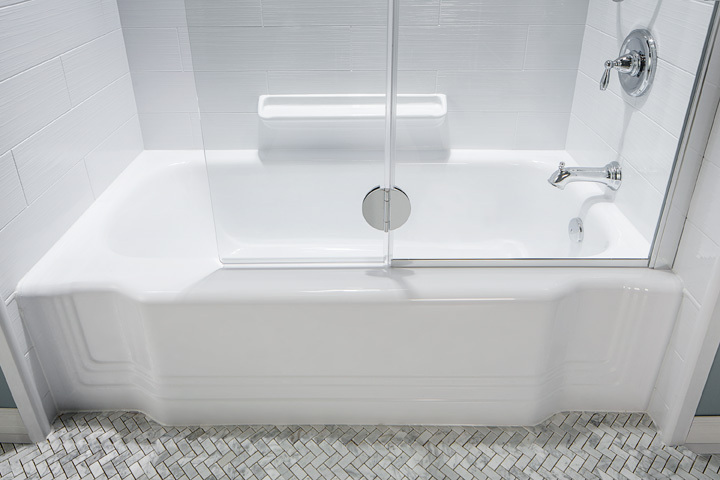 After your bathroom remodeling project with BATH FITTER is complete, you’ll be happy to find that our acrylic bathtubs and acrylic showers are extremely easy to clean and maintain. Just use any of the readily available products to clean your bathtub, tub surround or replacement shower, and it will look as great as the day it was installed! See an updated list of common household cleaners that showed no harmful effects when tested on BATH FITTER acrylic. See an updated list of institutional cleaners that showed no harmful effects when tested on BATH FITTER acrylic. To keep your drains running freely, we recommend you pour 4-5 quarts of boiling water down your tub or shower drain. After the water has drained, pour 1/2 - 1 cup of white vinegar down the drain. Done monthly, this will keep your drains clear of soap scum, shampoo and other hair product residue. If you should ever get a clogged drain. DO NOT USE DRANO®; it will harm the acrylic. Here is a natural solution that will work. Pour 3 tablespoons of baking soda into a DRY DRAIN, then 2 tablespoons of white vinegar into the drain; this will bubble up. Wait about 15 minutes, then add HOT WATER. This should clear the drain. Repeat as necessary.